AS1700 for Dual Swing Gate is a benefit to the residential and commercial applications. It applies remote usage and avoids manual operation that keeps you calm and dry inside your vehicle. 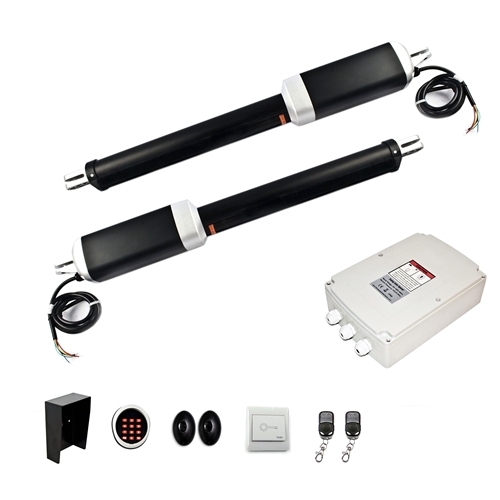 ALEKO AS1700 swing gate opener is having a 24V DC motor which regulate the opener. It can resist gates weighing up to 1700 lbs and length up to 26 ft (13 ft and 850 lb per leaf). The smooth running of motor gives the opener a greater life and durability. An utility battery backup is always provided in case of power loss to cease the power loss. ALEKO AS1700 swing gate opener may be installed with low cost, low voltage wiring in remote areas also.